Grow Home takes first subscriber vote. Sony has announced the September lineup for the PlayStation Plus Instant Game Collection program, including the first game to have been voted in by the subscribers, Grow Home. 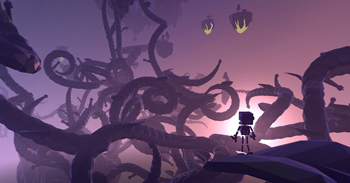 In addition to Grow Home, the products available in September feature a very strong collection of great 2D platformers. Emotional, wordless Teslagrad (PS3/PS4) will be available, while Super Time Force (PS4) brings a more manic gameplay. Also making the list is Xeodrifter (PS4/PS Vita), a sci-fi platforming shooter from Mutant Mudds studio Renegade Kid due to release at the start of the promotion and, perhaps the benchmark of brutal exploration games, La Mulana EX (PS Vita) makes the cut as well. Rounding out the list (and impossible to be more different from it), the PS3 release of Twisted Metal will also be available. PlayStation Plus subscribers who were more interested in the other two games proposed in their Vote to Play system, Armello and Zombie Vikings will be able to purchase those games at a 30% discount until September 15.